(Harbye, March 2014) – Sevra Baklacı is a young woman journalist, Turkish and a bit Syrian. Sevra is a gentle person who lives pursuing her ideas, her sense of justice. But because of being a journalist she was put on the killing list of the Syrian opposition. In 2011, a few miles from Antakya, Syria Civil War broke out, few months before Sevra moved to Damascus to improve her Arabic, “in Hatay our mother tongue is Arabic, but since the Turkish government policy does not allow the teaching of Arabic at school, I did not know how to read nor write. When I arrived in Damascus, I felt like I was back to my routes, I was at home. In Turkey it was hard to live my culture”. The province of Hatay is a strip of land that penetrates into Syria, it was annexed to Turkey in 1939 following a referendum. 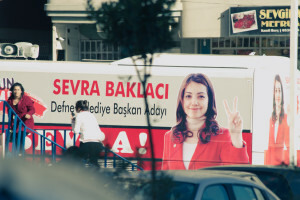 November 2013, the war continues, Sevra is in Damascus and TKP, the Turkish Communist Party, proposes her to be their candidate for the election in Defne, a district of Hatay province. She agreed, and two months later, in January, she returned to her hometown. Defne becomes a district after Erdoğan’s “Metropolitan Law”, which redraws the districts, a law aimed at elections, a law of the government, for the government. Defne is historically the region in which Alawites live, by holding the majority. Separating this district from Antakya, the electorate Alawite won’t affect voting in the city, but it will be confined in his own constituency. “I went home and I started the campaign for March 30’s local elections. Now I’m here, I feel like a fish out of water”, she says. The time she can dedicate to herself it’s not much, for a person like Sevra who likes to be by herself, a career in politics is perhaps the most difficult, antithetical to her gentle personality. Each day is divided between meetings with the party and meetings with the public. 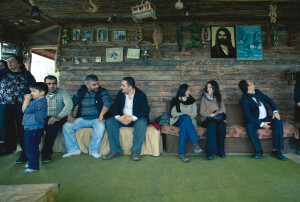 The political methodology is very active and personal in southern Turkey, especially for a communist party, confined to one percent of the vote. But Sevra, although she has spent several years abroad, is known by everybody, they all have expectations. “Defne de Sevra” say the writing on the walls, “Sevra to Defne”. ¹ KPSS: Kamu Personeli Secme Sinavi, Public Personnel Selection Examination.